If you are caught committing an offence on a motorway, the police can give you the opportunity to go on a half-day course to help you keep to the law in the future. You can only go on this course if you have had a police letter giving you the choice to attend. not taken a national motorway awareness course in the three years before your most recent offence. After completing the course, there’ll be no further action taken for the offence. But if you book a course, and don’t turn up, the case goes to the Crown Prosecution Service. What sort of course is it? It’s a relaxed classroom setting with other people who have committed an offence on the motorway, run by qualified trainers. 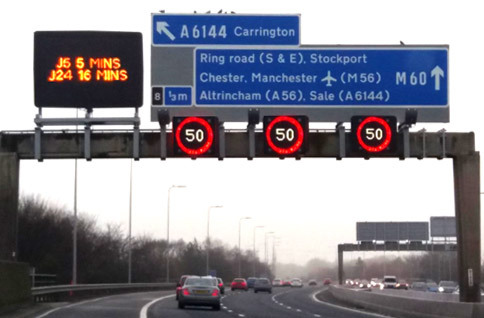 You’ll learn about ‘smart’ motorways, what causes traffic jams, and how to identify compulsory and advisory speed limits. There is no driving, and no test. It costs £90, but when you have completed the course you don’t have to pay the normal £100 fine, and you don’t get points on your licence. The courses are on different days at 8.15am, 1pm or 5.30pm. Your driving licence number. If you have lost your licence, apply for a new licence. If you have already booked your course, you can check the venue, date and time. You can change your course date up to the day before – although it must still be within the deadline set by the police. If the course is 14 or more days ahead, it’s free to rearrange. But if it is less than 14 days away it costs £41. The Scheme is administered and delivered by DriveSafe on behalf of the referring Police Force. The Scheme is run in accordance with national guidelines required by UK Road Offender Education. It is a condition of the course offer that you complete the course within a period of time imposed by the referring Police Force. If you are unable to complete the course within this timescale for whatever reason, you are no longer eligible and your offer of a course will be withdrawn. The Police are at liberty to withdraw the course offer at any time up to the point that you have successfully completed the course. The course fee must be paid in full at least 21 days prior to the course (if booking online the full course fee must be paid at the time of booking a course by debit / credit card). If you are unable to attend the course date allocated to you, you must contact us immediately to arrange an alternative date. By agreeing to the course fee, you are also agreeing that should you re-arrange your course with less than 14 days notice prior to your course date an additional fee of £41.00 will be payable. You may only book / re-arrange a course a maximum of 3 occasions. Under the Consumer Contracts Regulations 2013, you have the right to cancel your course within 14 days (the “Cancellation Period”) from the date on which you booked the course. However, your right to cancel and obtain a full refund will be lost if you book a course date during the Cancellation Period (in these circumstances you are entitled to a partial refund of £49.00 and you should contact us to arrange this). Any cheque returned by your bank due to insufficient funds will incur an administration charge of £12.00. Subsequent payment will only be accepted by credit / debit card or postal order. If you are bringing your own interpreter to the course, you must notify us in advance of their name and to ensure that there is sufficient space available (they must be at least 16 years and preferably a driver). There is no extra charge to bring your own interpreter. However if you wish us to book a professional interpreter for you, there will be a charge for this (please contact us for more information). If you need a British Sign Language Interpreter (BSL), please notify us at the time of booking - there is no charge for this. However if a BSL interpreter is booked and you fail to attend the course, there will be a charge for the interpreter to attend a further course with you. It is essential you bring photographic identification to the course (preferably a photocard style driving licence). If you do not have a photocard style driving licence, you must bring a passport or similar photographic means of identification. We can only accept original identification (electronic copies or photocopies cannot be accepted). Should you be unable to produce the required documentation, this will be classed as failure to attend. It is an offence to attempt to illegally misrepresent the true identity of another driver of a motor vehicle by attending the course in place of someone else. If you fail to attend a course, or are refused entry to a course if you are unable to produce the required documentation, it may be possible to offer you an alternative course date subject to availability and the Police time limit. This is subject to payment of an additional fee of £41.00. If you fail to attend a course due to illness, the additional fee may be waived upon receipt of medical evidence (e.g. doctor’s note). Late arrivals will not be allowed to participate. We recommend that you locate the venue prior to the course date. You must arrive promptly at the stated time on the day of the course. If an alternative course is not available, or has not been requested by you, your file will be returned to the Police for further action. A course checklist will be provided. It is recommended you use this checklist to ensure you will be allowed to participate. It is a condition that you present yourself in a fit state, having had proper rest and not under the influence of alcohol or drugs. You must be appropriately dressed for the consideration of other clients – no work clothes such as overalls or muddy boots. If you need glasses or contact lenses make sure you bring them with you. Mobile phones, tablets and similar electronic devices must be switched off during the course. Every effort will be made to accommodate any special requirements you may have provided you have notified us. If we have not received any notification from you, we cannot be held responsible should you be unable to complete the course. There is no course test, pass or fail. To complete the course you must attend all sessions on time, complete all course paperwork, make a positive contribution and demonstrate a willingness to improve your driving skills. However, any abusive or inappropriate language, threatening or disruptive behaviour towards either our staff or other clients will result in you being removed from the course. If you fail to comply with these Terms & Conditions, you will be certified as non-completion. In such cases the offer of a Diversionary Course will be withdrawn and your file will be returned to the Police for further action. In these circumstances you are entitled to a partial refund of £49.00 and you should contact us to arrange this. Any course refund will be made using the same method of payment as originally used. In the unlikely event we are unable to deliver a course due to reasons beyond our control, we will reschedule your course as soon as possible within the time limit imposed by the Police at no additional cost to you. DriveSafe shall not be liable for any fees, costs and/or any other expenses incurred by you as a result of a cancelled course.